Are you looking for an easy way to entertain with out the hassle of cooking on thanksgiving day? Smoke & Spice a Miami Caterer since 2003 will be in the kitchen all day on Thanksgiving preparing delicious slow roasted turkeys and tasty side dishes for Thanksgiving day meal delivery’s. For more information click on the menu below or call our Miami Thanksgiving drop-off catering hotline at 305-248-4535. 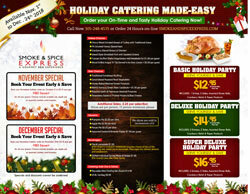 Everyone has their favorite Thanksgiving menu items, and our Smoke & Spice Fine Catering & Events team is no different. Our Thanksgiving menu will walk you through what we’ve seen to be the most popular options.